Long-term investing: short-term investing gone wrong? So consider value as an investment category. Words to the effect that “the market always recognises the economic fundamentals of sound enterprises in due course” are part of the strap lines of value managers: intrinsic value against market prices; 60 cents for a dollar; and so on. In overvalued and irrationally exuberant markets this approach frequently provides poor returns relative to benchmarks as market participants suspend good sense. Still, after the fallout of such episodes the value manager’s reputation as a paragon of sober logic is burnished. And thus the proposition that the oft mad market will come round and fully price the fundamentals of a value enterprise remains seductive. So much so that the possibility of the fundamentals coming round to align with prices is frequently overlooked. Yes, time does not heal all mispricings. Much can (and does) go wrong as it elapses - and as the architecture of financial markets evolves. Last week, for example, Francis Chou was reported by Bloomberg as returning his 2015 advisory fee in an act of solidarity with his investors who lost 22% in his Opportunity Fund. Mr. Chou had a poor 2015 but, historically, is a strong value manager - as he points out in the article by referring to his great long-term record. Nonetheless, 22% is quite a drawdown to ascend in reasonable time without taking excessive risks. An outlier? Some readers may be thinking “Warren Buffet” just about now. 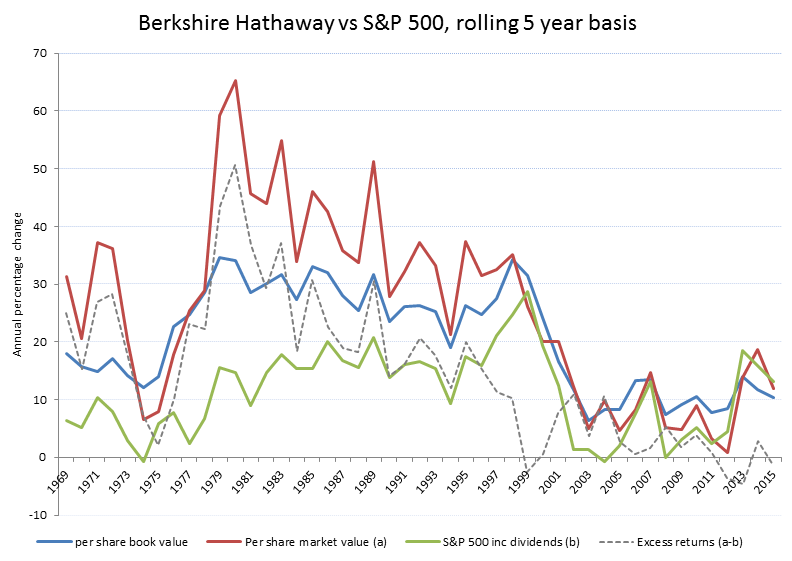 Below is a chart of Berkshire Hathaway’s performance versus the S&P 500 on a rolling 5 year basis. 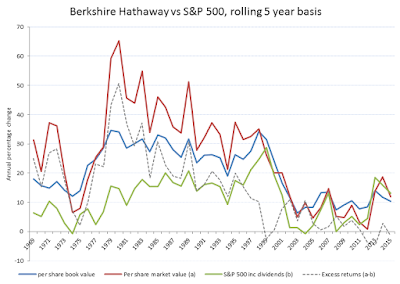 Even the King of Value has found the job tougher and tougher since the turn of the century.